The Convivio Team is working hard to have everything ready for the Conference but we need your prayers! This is God’s work and He is the one who will touch the hearts of the participants and all those involved, so that we may come closer to Him. Please pray for the success of Convivio. For an abundance of participants, and that all those involved in Convivio may encounter the Lord more deeply. 1. Pray a Hail Mary each day. 2. Pray a decade of the Rosary each day. 3. Pray a Rosary each day. The first twenty-seven days are in petition and the additional twenty-seven days are in thanksgiving. Please keep Convivio in your prayers! On March 3, 1884, Our Lady of Pompeii appeared before the gravely ill daughter of an Italian military officer and, through her, gave the world a new devotion of tremendous power. For over a year, Fortuna Agrelli had been in great distress and even near-death. Indeed, her case had been given up as hopeless by the most celebrated physicians. In desperation, on February 16, the afflicted girl and her family began a novena of Rosaries. Two weeks later, the Queen of the Holy Rosary appeared before Fortuna one evening. Sitting upon a high throne, surrounded by luminous figures, Our Lady was holding the Divine Child on Her lap and a Rosary in Her hand. Both were arrayed in golden garments and were accompanied by Ss. Dominic and Catherine of Siena. 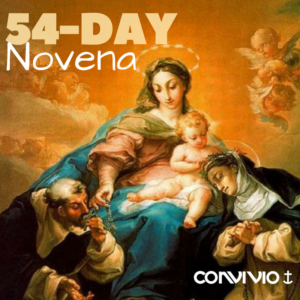 Obedient to Our Lady’s command, Fortuna and her family completed the six novenas whereupon the young girl was restored to perfect health and her family showered with many blessings. To download a Prayer chart CLICK HERE.